Stopping and then restarting work on Seattle’s downtown streetcar expansion will come with significant costs. But city officials are not confident in some financial estimates for the project, which now is projected to cost $200 million. The delay in expanding Seattle’s downtown streetcar system could last as long as six months — a stoppage that, if the project is restarted, would result in cost increases of $10 million to $14 million, city officials told the City Council on Monday. Mayor Jenny Durkan ordered a halt to all work on the project last week, after a preliminary review found a budget shortfall of more than $23 million. A more thorough, independent review is currently underway to assess the full costs of building and operating the streetcar. The city expects to hire an independent consultant to help with that work by the end of the week, City Budget Director Ben Noble said, and the full report should be done by mid-June. The cost increases caused by the delay include possible escalation clauses in various contracts, as well as an estimated $500,000 for staff work and to conduct the independent review. The $23 million shortfall is separate from about $35 million in utility work associated with the project. Some of that utility work is necessary to build the streetcar along First Avenue, and some of it would be done while it was convenient, because the street would be torn up to install rails. The projected cost increases bring the total cost of the project to more than $200 million, up from $177 million last year. Utility work in Pioneer Square began late last year. Work will continue to replace a seismically vulnerable water main, but once that is complete, the street will be restored during the pause. The 1.2-mile streetcar line would run along First Avenue, largely in its own lane, connecting the city’s two existing but separate streetcar lines on First Hill and in South Lake Union. 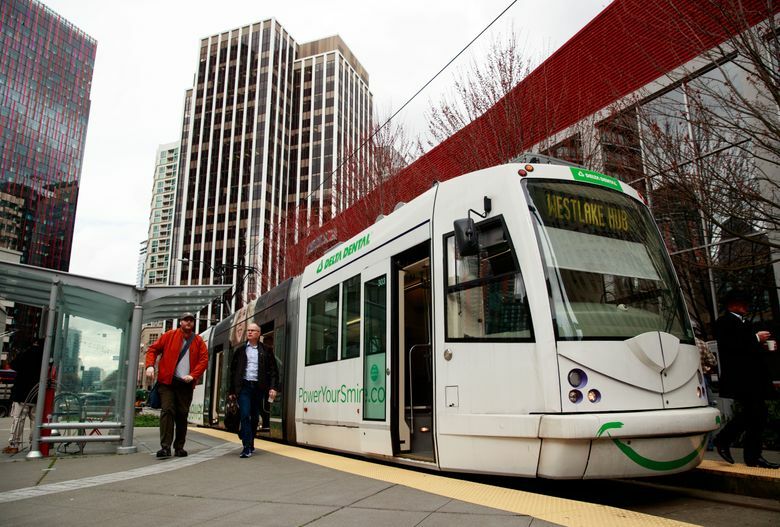 The reassessment of the project follows a Seattle Times report last month that the annual cost to operate the new, expanded streetcar system could be 50 percent higher than what the Seattle Department of Transportation (SDOT) had publicly stated. “We honestly don’t know what the correct number is,” SDOT interim Director Goran Sparrman told the City Council on Monday. Sparrman, who took over at SDOT late last year soon after Durkan took office, said he has reassigned several people who had been involved with managing the project, but declined to give more details. Durkan’s office is also working with the city attorney to investigate how the streetcar project has been managed to date. That investigation limits what city officials were willing to say publicly Monday about how the project arrived at this point. City Attorney Pete Holmes attended the City Council briefing to ensure that details of his ongoing investigation were not discussed publicly. “I don’t want to get into a ‘What did you know and when did you know it,’ ” Councilmember Debora Juarez said, asking about when the city first became aware of cost overruns. “When you were in law school, did they tell you what this means?” Council President Bruce Harrell said to laughs, as he mimed a throat-slashing gesture. Holmes responded that the details of what they’re looking into must remain confidential while the investigation is in progress. Several City Council members said they hoped the pause and examination of the streetcar project could provide a catalyst for re-examining how they oversee big city projects.